Today I presented twice. The first presentation was on working with multiple generations in the workplace. The second was CAD Leadership and Leading Change. Each class was well attended and somewhat interactive. I am writing this from the show floor and the crowd is not thinning out as the evening wears on. I visited the Bluebeam booth and was impressed with their product and their booth. 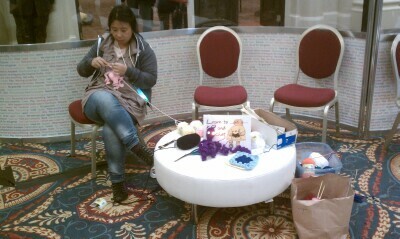 One interesting thing that I did see today was the offering to be taught how to knit or crochet. Right there in the middle of a high tech conference was an Autodesk employee offering to educate you on the fine art of handcrafted creations. 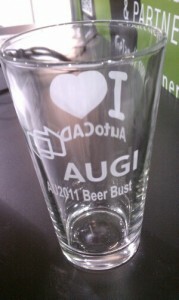 AUGI Top DAUG continued to be in full swing with many watching the tote board for updates to the top ten lists. Tonight was the Annual Beer Bust and the passing out of the AUGI Beer Mugs.